Isn’t an Oregon Quarterback SWEEP Risky? 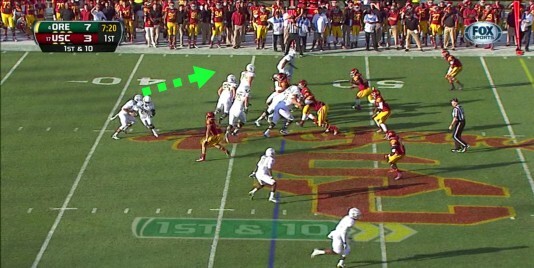 Imagine my surprise to find ANOTHER new play in the USC game, the Quarterback Sweep! Last week we enjoyed the revelation of “Sucker Plays”. 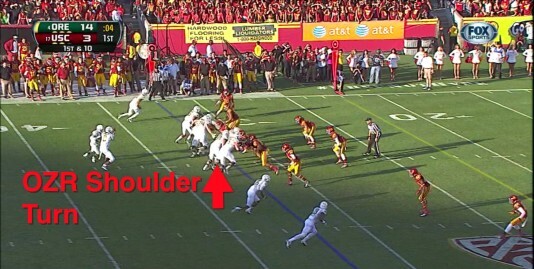 As I reviewed it, I began to think about the other plays that the Oregon QB serves as the ball carrier and began to wonder about at what point is it too risky to be putting a tremendous player in such an exposed position for injury? It becomes an interesting question when we look at the scenarios surrounding the plays that the Oregon QB carries the ball and why. Your thoughts? 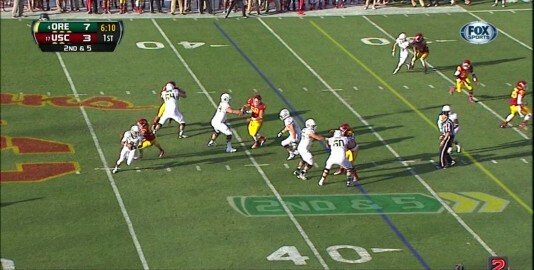 The first QB Sweep (Above) was run out of the Sweep Read blocking as you see the linemen pulling to the left. This is actually the opposite of how we usually run the Sweep Read, as we want the Running Back to be going left and the QB going right. 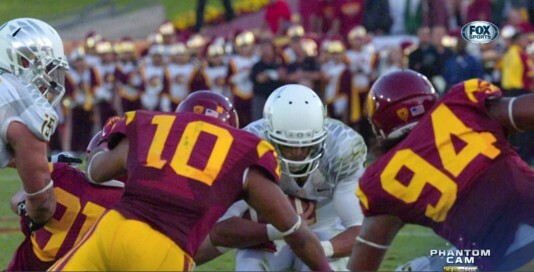 Perhaps in this game Oregon knew USC would key on Kenjon, (good call) and it would open up running opportunities for Marcus Mariota. One block was defeated and our QB was upended for a five-yard gain. Being out there in open field makes me nervous with seeing how defenders go after the Oregon QB who has blossomed into one of the nation’s best. Am I over-reacting? 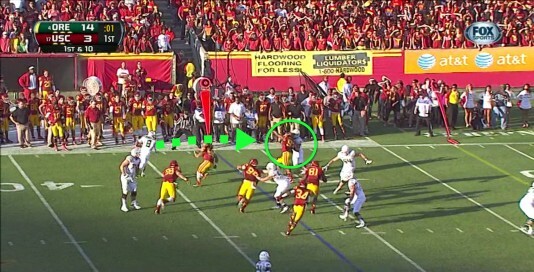 Duck quarterbacks have a reputation of being mobile and able to evade many of the blitzes that come at them. Above we see Mariota evade the pass rush and scramble for a first down. Pretty routine, but is it different than a sweep? One of the surprises of this game (Above) and the Fiesta Bowl was Marcus going back to pass and then taking off in a QB Draw play. Both times we made a great chunk of yardage and at the end of both examples the Oregon QB did well to “Duck” and slide into the tackle. The focus on Barner was extreme as not only did Oregon run Zone Read pull the ball on occasion, but also the Ducks actually ran a Mid-Line Zone Read where the Defensive Tackle is Zone Read or optioned, and Marcus pulled the ball and ran for over fifty yards. 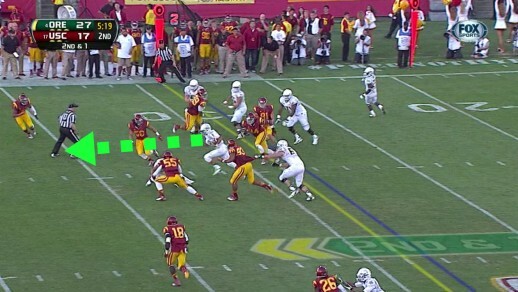 (Above) Again these are routine plays where the QB is the ball carrier in the Oregon offense. Why would the QB Sweep make me uncomfortable? 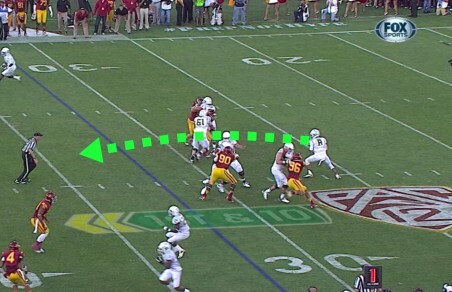 It is the picture above that illustrates the concern with the Zone Read play as this is an instant before two Trojan defenders bash their helmets into Mariota’s to stuff a QB keeper on the Inside Zone Read. The hit was so hard that Marcus was clearly woozy the next play as he fumbled the snap and the Ducks lost the ball to USC. The next QB Sweep example features different blocking as this time we see (Above) Outside Zone Read blocking to the left as again Oregon is reversing the positions of the RB and QB. Usually it is the RB going to the left, but the Ducks must have felt again that they could pull the defense over to cover Barner and open up space for Marcus Mariota to run. 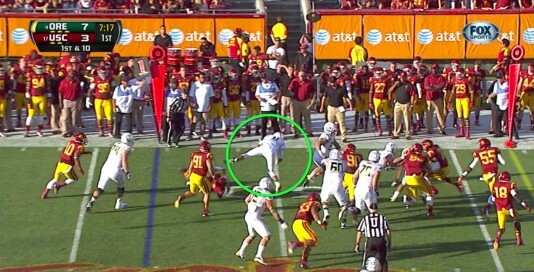 As Mariota approaches the sideline (Above) we see some extraordinary blocks sealing defenders to the inside such as Colt Lyerla’s block that he continued for two seconds after this screenshot to drive the Trojan out of the play completely. 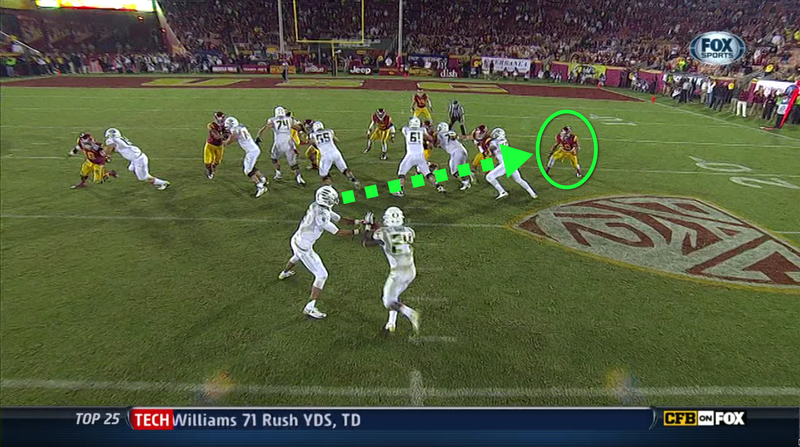 Truly an amazing block that sprung Mariota down the sideline. The Oregon QB has turned the corner and is jetting upfield for a big gain due to the superb blocks of the linemen and WRs on the defensive backs. Yet compared to some of the other plays from this game that we have seen, is my concern about this play being a little too risky justified? 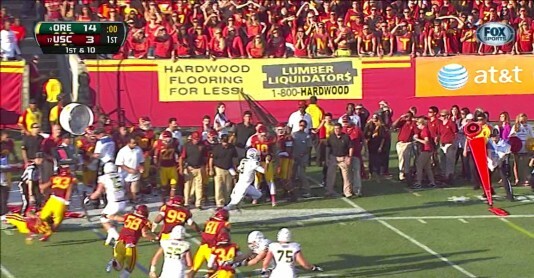 I credit the Oregon Coaching staff for bringing this additional element into the Oregon Game plan as it helped to thwart the fixation of the Trojan defense on our RBs, which in a paradox, actually helped open the offense up that much more in this game to set new records of offense and scoring EVER on a USC defense by an opponents Running Backs.